When you can reuse or re-purpose an item, you are not only saving it from the landfills, but you are also saving the expense and energy which would have been expended when you recycle. Of course there are personal benefits as well – you save money by not buying or by buying used and you save money by not paying sales taxes for a new item. You also get the personal satisfaction of the “wear it out, make it do or do without” mentality. Readers, I know you reuse so please add your comments below to trigger thoughts about additional ways to reuse things! Here are some of the ways I reuse things. We have a driveway that dead ends on our property, yet people keep trying to drive up it. When they discover it is dead end, they spin a circle in my blue berry patch to turn around and go back, causing lots of ruts in our ground. I cut a heavy blue plastic trash bag into triangles, stapled them over a rope and hung the rope across the driveway to block those drivers from using it. It works great and I didn’t spend an extra cent making it. We also use these large blue plastic bags as coverups for luggage when we take our van on trips, so that passerby’s can’t peek in and decide to break in to steal what we are carrying. To keep our kitchen trash can clean, we use either a heavy paper bag or a small plastic bag. Instead of throwing the kitchen trash can bag into the garbage each time we empty it, we empty the trash out of it and keep the smaller trash bag until it is just unusable. Years ago, I learned to reuse freezer bags. My Mother-in-law always washed hers out and dried them and then used them again. We do this for all bags except those used for meat or those that get stained. I don’t freeze food in the used bags, but do use them for leftovers in the frig. My spouse has many plantings around our several acres. When he plants something new that needs a steady supply of surface water, due to shallow roots, he sometimes uses a 2 liter soda bottle. He cuts small holes in bottom, fills with water and places it next to the baby plant to drip irrigate it. Before throwing away old clothing, I snip the buttons off and remove working zippers (unless I’m donating the item). 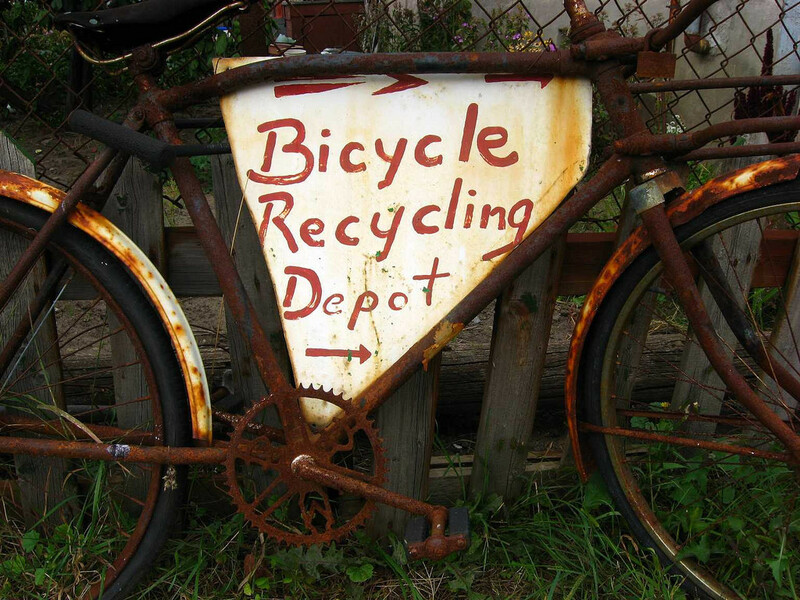 We reuse both kinds of items for replacement parts, crafts and etc. I’ve also cut up old pieces of clothing to use as quilt pieces and used old men’s cotton tshirts for rags. My Mother-in-law used to bake small cakes at Christmas time in empty vegetable cans to give away. I’ve never done this myself but food.com has this recipe for Tin Can Cakes. You all know you can make puppets for kids from an old sock. Just slip it over your hand and use your thumb and fingers to make a mouth. If you want to get fancy, draw, paint or sew buttons on it for eyes. My spouse uses socks to store seldom used delicate items (like his fancier watches, rings, antique compasses, and etc.). We have some old clip on style clothes pins left over from the days I used to hang laundry on the line to dry. Now we use them as chip bag fasteners as well as to hold the garden mesh netting on the chicken wire circles that surround my blueberry bushes – to keep the birds and squirrels from eating the ripening berries. Years ago my Dad made a screw driver holder to help us organize our growing collection of screw drivers. He took an old coffee can, covered the outside with contact paper (just to make it look better), then cut some corrugated cardboard to the height of the can and spiraled it inside the can. You just poke the screwdriver down into the cardboard and it is held upright. Our one pound coffee can holds about 20 screwdrivers this way. It has been in constant use for at least 40 years! I bake Christmas cookies every year to give away to family and friends. My recurring problem, of course, is that the cookie tins seldom come home to be refilled. We drink lots of coffee and buy the 3 pound tins. We save them to use for a variety of purposes, such as holding paints, storing popcorn bags and yes, making Christmas cookie tins. If you are rushed for time, just fill with cookies, put the plastic lid on and slap a bow on it. If you have more time, you can put some wrapping paper around it. When I was in the Horizon Club, we did a fund raiser that required us to wash a bunch of windows. The leaders had us use vinegar and water along with newspaper to clean, dry and polish the windows. All crafters know the value of Popsicle sticks! My cub scout used them in his troop meeting to make circular potholders for Mother’s Day presents. Holes were drilled close to one end and in the middle of each stick. Then, thin elastic was threaded through the end holes and tied together. Blue and yellow beads were used as spacers for the middle holes. Elastic was threaded through each hole, either a blue or yellow bead placed after each stick and then it was tied. Mine has survived for years (that cub scout is now 35 years old!). We also used popsicle sticks for shims, toy buildings, plant markers in early spring gardens, stir sticks and more. There are many more common household items we have reused, including toothbrushes (cleaning tools), old paint brushes (cleaned they help dust intricate furniture); small plastic soda bottles (as a base for paper mache piggy banks like the ones I used in my 2014 Grandma Rie’s Money Camp); wine bottles (as centerpieces or candle toppers); as well as cat litter and human hair (as deer and critter repellents). What do you reuse and how do you do it? That’s maddening that people run over your blueberry patch! I reuse all my Amazon boxes for when I sell things on Amazon. I can’t remember the last time I bought one from the post office. My mother-in-law tries the rags thing, but she uses sheets, which definitely does not make a good rag haha. Very good info, I might have to try some of these tips. Thanks for sharing and for making the planet a little healthier! Great idea, we definitely re-use a lot of these items that you listed. Egg cartons can be re-used for planting seeds too.